Time to start thinking as you move into the chess middlegame. After a flawless execution of your favorite opening your army is poised and ready to strike. Your pawn structure is rock solid. Your King is safe and your minor pieces have a vice-like grip on the center. Your Rooks have been centralized, ready to take command of key files. Your Queen is waiting in the wings, safe from harm and well stationed. Your position is picture perfect as you transition from the well rehearsed book moves of the opening to the more intuitive maneuverings of the chess middlegame. You don't want to blow all of your good work so far by taking the wrong road. How do you weave deadly tactical play into your solid positional structures? What do you need to think about as you devise a way forward? There is a huge diversity of middlegames arising from many different openings. And yet there are a number of motifs that pop up with surprising regularity. Chess Middlegame: Kramnik - Carlsen, 2008; Black's compact Hedgehog System gives him a majority in the center but White has more space, which is more important? The battle for control of the center is crucial in open games. This will give you control over the key files and diagonals. Centralize your pieces and see to it that everything is supported. A Knight on an advanced outpost can really cramp your opponent. He has to keep his heavy pieces off a number of squares in the heart of his camp. This really compromises his mobility and activity. Soon his pieces are stepping on each other's toes. Make sure your advanced, central pieces are protected by pieces as well as pawns. If you have to recapture with the pawn, you will lose your outpost. Players choose their openings based on middlegame positions arising from them. People look for certain things in the middlegame that they like to play with. One of those things are pawn breaks. A pawn break is simply the opening of a certain file by means of pushing a particular pawn. Plans and motifs come attached with openings and pawn breaks. I like the English Opening for instance because in some variations I can choose between pawn breaks with the b-pawn or the f-pawn. Or believe it or not sometimes even the h-pawn. Quite a number of middlegames feature play against an isolated pawn. In most cases this will be the d-pawn. In the middlegame the d-pawn is arguably a strength because it's pieces enjoy great activity. The side playing against the isolated pawn will blockade it and build up pressure on it in an attempt to win it. The other player will naturally protect the pawn with every piece he has. Slowly but surely the attacker will try to force exchanges. With each exchange he grows stronger. Not only are all the active pieces leaving the board, but also the pawn's defenders. As we move into the endgame the pawn can become a weakness. The last thing you want in the middlegame is a backward pawn. It is however something you would love to give to your adversary. If he gets one it's open season on that sucker. Pile as much pressure on it as you can. You will force him to bring all of his pieces to it's defense. They will become passive and you can win the battle for space and activity. If you can get more numbers attacking the pawn than he can defending you will have an important decision to make. Do you capture and take the material spoils? Or do you blockade it with a Knight in the hole formed in front of it? That would give you a positional advantage. Every situation has it's own peculiarities so choose carefully. I used to always hate it when my opponent gave me doubled pawns (two pawns on a single file). My beautiful pawn structure ruined. I'd think I would have a really hard and unpleasant grind ahead. Now doubled pawns aren't perfect, that's for sure. It does mean another pawn island. If the Knight pawn is forced to recapture as is often the case it will mean an isolated Rook pawn. That's never good. But they're not all bad either. They can have a certain dynamic strength. The lead pawn can be used for a pawn break and you've still got another one to push. You also have an open file to play with. You're thinking about giving someone doubled pawns? Or anticipating doubled pawns yourself? Try to figure out if they would be an asset or a liability. Hanging Pawns - Strong or Weak? Hanging pawns are another middlegame phenomenon which are not easy to assess? Are they good or bad? First of all what are they? They are two friendly pawns on the same rank and on adjacent files. But cut off from other pawns by open files. They are certainly viewed as a target in the middlegame. They have a dynamic power as they are threatening to advance and cannot be blockaded. But they are not defending each other so they are vulnerable. If you face them you ought to attack them relentlessly with your pieces. You are trying to force one of them to advance. This will make the rear pawn a backward pawn and you can blockade them now. Now they are static. Less vulnerable but also less threatening. When you start the game you have just one pawn island. Your pawn chain stretches from the a-file right across to the h-file. As the two armies collide and tear into each other this changes. Files may get opened up and pawns get doubled, even trebled. Some will be captured. You no longer have a perfect chain stretching from one side to the other. You have two or maybe three groups of pawns connected to each other and disconnected from the others. Each of these little groups is called a pawn island. The more pawn islands you have, the more structural damage you can be said to have taken. It is better to have as few pawn islands as possible. This would mean you have less holes in your defense. A lot of time and effort is put into creating a majority on one side or another. The hope is eventually this will lead to a passed pawn. So a minority is bad then right? Actually in many openings players play for positions that will inevitably leave them with a minority on one wing. They are quite happy to do so because such a middlegame will lend itself to a little motif known as the minority attack. You will throw your minority forward headlong into the waiting majority. By the time the minority are dealt with, your opponent's once proud majority will be a fractured mess. They will be easy prey for your hungry pieces. Why are Queenside majorities especially prized in the middlegame? Surely a Kingside majority is just as valuable? One of the advantages the former enjoys over the latter is the licence to advance. Everyone knows that pawns more than anything have an insatiable desire to move forward to promotion and annex territory for their army. 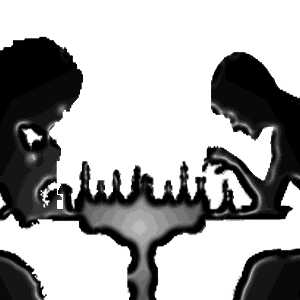 Kingside pawns, must in the middlegame, curb their own ambitions and provide their King with protection. The Queenside pawns have no such impediment. If the Queenside pawns get a four on three, three on two or two on one advantage, then they may drive it home. They are on the march. Aron Nimzowitsch revolutionized positional chess with his ideas on blockading. He wanted to restrict space and activity available to his opponents. He showed that by not allowing enemy pawns to advance he could win the battle for territory. He believed that with more room to move he could get the better pieces and the upper hand in his games. For this reason he made blockading one of the cornerstones of what he called My System. He placed minor pieces, preferably Knights, in front of enemy pawns whenever a hole appeared. If the adjacent pawns were further advanced or exchanged off, the Knight could not be chased away from the blockading square. The Knight would then receive as much protection as possible from his colleagues. This would create a major problem in the enemy ranks and some major concession might have to be made to get rid of the blockade. It's a good idea to play for an advantage on square colors. If the pawn formation around the enemy King has holes or outposts of a certain color you can come up with a plan to capitalize on that. Often you will come up against a fianchetto defense. If you can you should try to exchange off the defending Bishop. This will leave the King feeling quite uneasy with undefended squares on his front doorstep. If you manage to get rid of that Bishop while retaining your own Bishop on that color, even better. Any situation where most or all enemy pawns are standing on one color square, it usually means there are weak, undefended squares of the other color where you can post your pieces. Always try to keep your Bishop of the weak complex on and get his Bishop off. If you have a chance to exchange them take it. Chess Middlegame: Polgar - Karpov, 2003; White wins with 25.Bxh7! and 25...Kxh7 is hopeless. With the Queen arriving on the h-file with tempo and Rh3 in the air, Black is lost. 26...Kh8 loses to a second Bishop sacrifice, 26.Bxg7!!. The Bishop Sacrifice on h7 (or h2 for Black) is a thematic sac aimed at destroying the King's cover. Once you cross the Rubicon and give up the piece you must then continue the attack with all the energy and intensity you can muster. Once the initiative you gain from the sacrifice peters out you are just down a piece and in a lost position. So you have to do whatever it takes to keep the pressure on as you hunt down the King. Don't allow him any respite or he will start to bring his pieces into the game. As long as you can keep them sitting on their home squares, your opponent's material advantage will be of no use to him. If you have to make a second sacrifice to retain the initiative and finally checkmate the King then do so without hesitation. Indeed there are many examples of a double Bishop sacrifice. The Rook Lift is a common maneuver in some middlegames. The opposing King can really feel the heat turning up on him when the Queen's Rook swings across from one wing to the other to say hello. A little bit of prep work is required to create the conditions for the transfer. You have to make sure you don't close the position before the Rook gets across. The third rank must be left clear. One of the openings associated with the Rook Lift is the Budapest Gambit. It has the Adler Variation where the a-Rook swings across to the Kingside and then the fun begins. This Rook is known as the Budapest Rook. Rooks are worth 5 points, minor pieces are worth 3. That is what we are told early on. The point is well made. The Rook is a stronger piece than a Bishop or a Knight. However a piece's value is not set in stone. The values just mentioned are mere nominal values. In other words, all things being equal and with no special circumstances in play, the Rook is better. But then there always little quirks and qualifications floating around in a chess position. That's what makes a piece's value fluctuate throughout a game. A passive Rook is inferior to an active Rook and a Knight entrenched on e5 is as good as any Rook as is a Bishop on a long diagonal. Considerations such as these give rise to the Exchange Sacrifice. Chess Middlegame: Nimzowitsch - Systemsson, 1927; This position is taken from a fictitious game. It's a parody of Nimzowitsch's annotation style written by his friend Hans Kmoch. Although it's not a real game it gives an exaggerated portrayal of it's subject, overprotection. Here the d5-pawn gets the support of every White piece except the King. That's six pieces versus just one attacking it. It is over-protected and therefore very secure. What is a strategic point? In short it is a key square. A square that once gained control of, can open up the road to victory. Worth fighting for right? How do we know a strategic point when we see one? A strategic point can be an advanced outpost or an entry point into the enemy camp. Basically any must have square. When you seize control of such a square it is vital to establish yourself there. In the case of an outpost you should occupy it with the most appropriate piece. It already enjoys the protection of at least one pawn. In addition to this you should add further protection with as many pieces as you can. This way if it is taken you can complete the recapture with another piece rather than a pawn. That way you can maintain the point as an outpost. When you can truly say you have mastered these motifs along with positional and tactical elements then you are a force to be reckoned with. The motifs discussed here are used in no small part as tools to achieve your positional aims and tactical objectives. The key to good middlegame play is blending sound positional sense, a keen eye for tactics and the awareness to know when it's time to put any particular motif into motion. Of course you will prefer some middlegame positions over others. You can decide early on the nature of the game you want to play. This depends on the opening you choose. Start with a major opening like the Sicilian Defense.